Preheat your oven to 375 degrees and lightly spray a baking sheet with nonstick olive oil spray. Mix together flour, baking powder and salt. Use a spatula to add in the yogurt and mix until dough starts to form. Flour your hands and knead dough. Add more flour if necessary and roll into one large bowl. Divide your dough into 8 small pieces and roll them into sticks about 8 inches long. Loop you dough and create a knot. Place your knots on a baking sheet and brush tops with olive oil. Bake for about 17-20 minutes until tops start to turn a golden brown. While you knots bake, heat your skillet with your butter and add your garlic. Sauté for about 4 minutes until garlic starts to get golden. 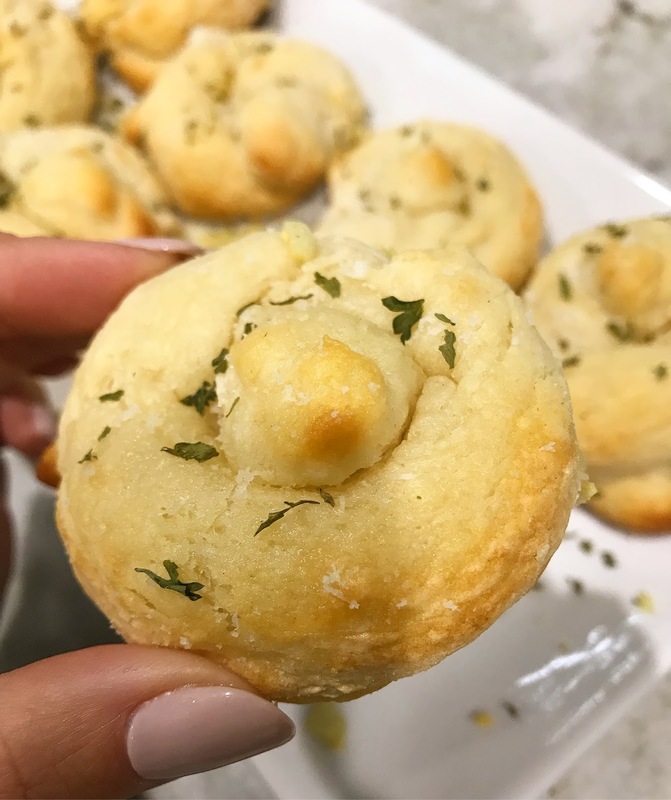 Turn off heat and toss in your garlic knots giving your pan a few tosses until your knots are covered. Take an excess butter and garlic and brush onto the tops of the knots. Plate and sprinkle with parsley and grated cheese.